The project is devoted to the development of ultrafast laser processing for advanced mobile displays. The objective is to develop a non-thermal, ultra precision machining process using femtosecond lasers and novel optical systems for beam shaping and pulse shaping. The objective is to provide a fully customised fabrication means for high resolution mobile displays as submicron precision is required as the pixel size of such HD displays decreases. The objective of this program is to develop new assembly processes compatible with SiC components in order to propose demonstrators compatible with high temperature. Time frequency applications require reliable, high precision, high stability, compact and cost effective clocks. Cesium atomic clocks are currently considered as the most suitable devices complying with such requirements. The objective of LAMA is to develop of highly reliable and cost effective laser diode modules: this is one of the most challenging part of atomic clocks and the key to achieve a complete European supply chain in this field. LOCCIMIM aims at the development of a new generation of low size and low cost ferrite circulators made by LTCC (Low Temperature Co-fired Ceramics) for telecommunication applications. The purpose of the project is to design, test and evaluate innovative interconnects and passive components for millimeter-wave applications. The purpose of the project is to bring an established additive, tool-less, fully digital and contactless inkjet technology, demonstrated as scientifically leading and fully proven with ceramic and organo metallics, all the way to a production-ready stage, of high throughput enabled rupture capability geared towards large area printed electronics applications. Design, test and evaluation according to space environment requirements, of the next generation of integrated circuits or hermetic module packaging for satellite applications. BoB project relies on innovative solution, which consists of splitting the PCB board in 2 thinner PCBs which are interconnected with a very high dense flexible circuit and through pins. Each thin board will use IPITECH technology (stacked and copper filled microvias). The EURIPIDES-CATRENE co-labelled THOR project is developing highly efficient, integrated and reliable power electronics technologies offering new applications and increasing the competitiveness of major European industries in automotive, aeronautics and healthcare applications. The project aims to exploit new technologies for discrete power components, power cores and storage elements - currently one of the most promising areas of electronics - while improving the robustness and reliability of high power electronics systems and facilitating their miniaturisation. THOR has been presented during the EURIPIDES 2012 Forum of Graz. Development of a new generation of printing process: ultra thin film deposition below 1 μm, printing on alumina, silicon and textile substrates. Development of functional building blocks of the smart micro system for intelligent working clothing, beds, and similar applications including system communication. 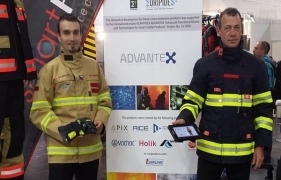 Smart system application in firemen clothing and other working clothing. COlour SECure photo on ID documents and ID cards with enhanced global security through colour "guillochés", robust ID image hashing, watermarking, and interlinking of graphical data with the enclosed chip-related information. The project has two main research objectives, both of them equally important to achieve the main goals for the project. Photo-acoustic spectroscopy (PAS) in combination with quantum cascade lasers (QCL) allows highly compact and extremely sensitive gas sensor systems to be built. The main objective of the project AcousticNose is the miniaturization of such a system by extensive use of photonic and microsystemsn technology. parameters. After local processing, data are uploaded to the Mobile Command Centre, displayed to the First Responder himself and stored for after crisis management. The SINETRA System is embedded in the suit of the user, it is an industrial proof of the so-called wearable PMR concept. SINETRA was presented during the EURIPIDES 2012 Forum of Graz. MIDIMU HD will develop a new technology making possible the design and manufacture of a high density mixed microwave and digital board, on a multilayer homogeneous material. MIDIMU-HD has been presented during the EURIPIDES 2012 Forum of Graz. 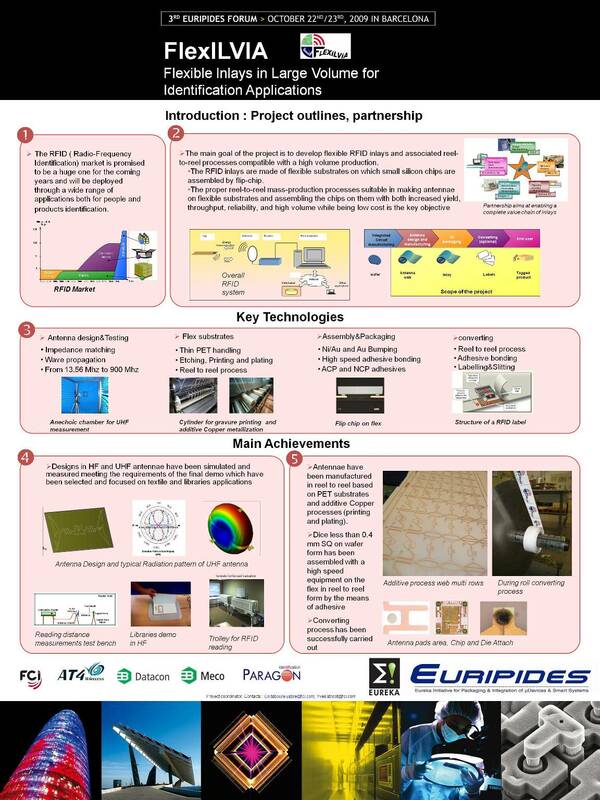 3DICE project targets the development of technological bricks for embedding dice into organic or silicon substrates, with single or multi layer configurations, in order to perform unprecedented smart system integration at wafer level for industrial high volume manufacturing. The IDEATA project aims at the development of a new phased array antenna architecture concept based on low cost technologies. Relying on previous EURIPIDES-EUREKA projects results, developments of innovative packaging and interconnection technologies should lead to the design of new phased array antennas able to fulfil all current and future X to Ku Band specifications. The proposed project aims at the development and the demonstration of such a solution. The project goal is to design and qualify new AIS equipment for the Aid to Navigation market. IQ FUEL will develop a highly integrated micro sensor system that determines the actual fuel composition in the tank In addition the new Fuel Quality Sensor can detect problematic substances in the fuel, such as sulfur, water within gasoline, additives, or other contaminants. This project targets the development of new technological solutions for the realization of innovative plastic components and interconnections for high frequency mobile and embedded applications such as communications, aeronautics and automotive. This project aims to develop new conductive adhesives which fill all functional requirements of present day solder and are intended to be a substitute for lead-free solder. COSY-3D was built up in collaboration with partners from industry, research centres and academia to create a structured 3D system which will enable the functions of memory, CPU, a stable MEMs or CMOS based oscillator, Passive components and some RF blocks to be integrated into the smallest possible footprint block. Targeted markets were: advanced telephony, multimedia, secure transactions. The results were very positive. Indeed, complex thick film circuits were printed and reached the same performances after sintering as screen printing (conductivity, sticking…). Multi-layered ceramic capacitors were shaped in a single stage of manufacturing and they were sintered without cracks or delamination. Finally, a new inkjet printer was introduced to the market and already released in more than 10 models for the ceramic industry, but also to the organic printing world, for the shaping OLEDs, organic photovoltaic or electronic circuits on flat and flexible substrates. Intelligent and Integrated Micro-Systems (IMS) represent the next electronic evolutionary step for the simultaneous integration of sensing, processing, actuation and power management, in order to achieve advanced functions such as multi-spectral processing, real time data analysis and adaptability in response to a changing environment. The IMS will have to achieve autonomous and self-reconfigurable operations, for real-time and efficient self-optimization of their performance. MEGA project is aimed at bringing together advanced microwave functions using wide band gap (WBG) devices along with RF MEMS active interconnections. High integration scale of multiple technologies : optic, silicon, mechanic, piezoelectricity, thermo engineering. Use of renewable energies : sun, wind, t°, mechanical vibrations and pulses. Electrical energy production : up to 20Wh per day. ENERPACK was presented during the EURIPIDES 2012 Forum of Graz. 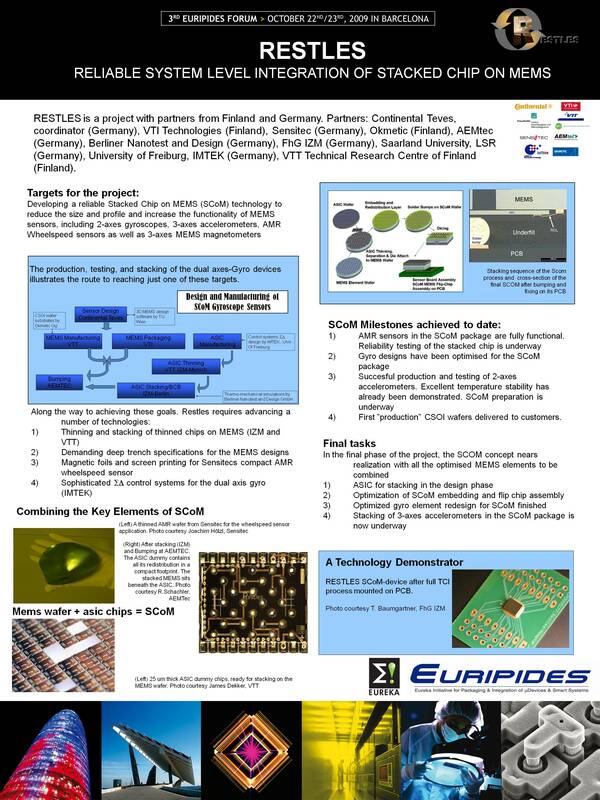 See ENERPACK poster presented during GRAZ Forum in 2012. TIMI project dramatically decreases the heat dissipation constraints in highly dissipative ICs, therein allowing easy customization at the upper level (above-IC) with memories, communication devices, sensors. This simple technology, based upon introducing a thermal barrier within the device interconnects, fulfils the major trend of the semiconductor industry of integrating multiple functionalities in 3D chips. The project aims at designing, manufacturing and packaging flexible antennae to be used in contactless object identification and tracking systems exploiting radio frequency identification technologies at short to medium distances. The CARUS project aims at the development of early predictive and advanced diagnosis technology for atherosclerosis in the carotid artery in response to the major health issues associated with cardiovascular diseases. The ultimate technological goal of the project is to develop an innovative high frame rate matrix ultrasound system for non-invasive real-time threedimensional quantitative assessment of structural and functional vascular properties. LAFMOT objective is to offer permanent high speed internet connection for “high speed train” travellers and crew. Antennas will have to maintain a radio communication between a GEO satellite and the train. The main innovation proposed in LAFMOT is the foam half spherical Luneberg Lens with source, where any point on the surface is a focal point. The antenna and its source will be realized with conformable foam plus metallization. The main goal of IPITECH is to be able introduce the very high dense technologies facing the reliability issue in harsh environment. The real important challenge is to mixe several important process steps of recent PCB technology to be able to design and manufacture attractive high end products. Ensure the fact that the specificities of the high end product will be satisfy. The project goal is to develop a communication module able to manage several existing protocols of short-range wireless communication in order to provide flexible and low cost solutions with respect to applications and scenarii of use. This project aims at developing new materials and manufacturing technologies for microwave ferrite components: circulators and isolators that will enable for reduction of the device size, weight and cost, and will therefore facilitate their integration and packaging in mobile telecommunication equipment of the new generation. The goal of this project is to design, manufacture and characterize a focal plane array, and to demonstrate its ability in producing Terahertz (THz) images at room temperature. IMATERA was presented during the EURIPIDES 2012 Forum of Graz. CANOPY project aims at the development of high performances carbon nanotubes/epoxy adhesives for boards assembly and die attach applications.